ABOUT US ship your boxes sea freight forwarding air freight forwarding moving? order container vehicle transport roll on - off shipping road and intermodal forwarding special cargo rate requests cargo tracking document center smart links references customers worldwide other moving from hungary GALERY usa purchase assistance? This is one of our favourite shipping service!! As we know boats are made for being in the water not for being transported, so we have to make sure your boat is ready for the voyage. To transport a boat always requires more space or a special trailer. In some cases a tow vehicle. - Boat on trailers. Almost the easiest way to transport and ship. Depending on the size we can have it towed or transported on a large low profile trailer. Trailer needs to be in good condition to be able to pull with a tow vehicle in any US road. If the trailer condition does not allow to tow your boat, we will make arrangements for transportation on a special trailer. 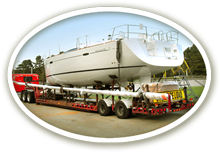 Transportation and ocean shipping prices are always the least expensive for boat on trailer option. - Boat has no trailer. We can help you find the trailer for your boat or we can build a cradle for it. To build a cradle is a time consuming move. Usually we have to remove your boat from the water or a storage and transport it to a facility where we will build a cradle for your boat. Here are a few reasons why your boat needs a cradle. Ocean carrier shipping companies does not accept cargo like your boat without trailer or cradle. At the time of transportation and shipping, something has to support the boat to protect it and to be able to handle it without damaging it. Boat on cradle will increase cost in shipping process because of special handling needed. - Sail boats or oversize boats. All boats need special handling, also removing parts to reduce shipping dimensions. Sail boats have keels and masts, these are large parts of the boat, always require special attention. We have to build a large enough cradle to protect the keel and give access to handle the boat safely. Masts have to be removed for shipping, wrapped to protect and attached to the boat to be able to clear bridges and low clearances. Motor boats and yachts are also requires careful planning before the shipping. Each vessel is different so we have to tailor the shipping plan for your boat. Removing parts of your boat and reducing overall dimensions is does not just give access to road transportation, (it) also give(s) you significant reduced cost of shipping. We also offer shrink wrapping for your boat, this will give you piece of mind for having your boat weather worthy for transportation and ocean shipping. In some cases we utilize float on service but unfortunately not to all destinations. Usually we can arrange it to popular yachting destinations around the world. Please click below link to download rate request for your Motor Boat, Sail Boat, Jetski.